It appears LG is entering the virtual reality gaming ring alongside the likes of HTC and Oculus, thanks to a little help from Valve. The electronics giant behind the upcoming LG G6 handset is demonstrating its first prototype for a head-mounted VR display at this week's Game Developers Conference (GDC), reports UploadVR. The prototype will be available for developers to try on at Valve's booth during GDC, with feedback influencing the final design of the commercial version. Because LG's supposed headset is still in the prototype phase, details such as a release date, price, or region availability have been left unannounced. Promising a "high fidelity, next generation VR experience" and given the gaming-heavy focus of GDC, (as opposed to the Mobile World Congress, which is also going down this week) it's likely LG is working on a full-scale VR headset for PCs akin to the HTC Vive. The tech maker is familiar with VR on a small scale with its more portable-minded LG VR 360 headset, but Valve's involvement points to its SteamVR PC gaming platform being part of the picture. 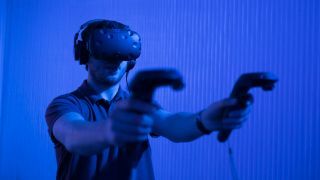 At the time of writing, the Vive is the only headset currently taking advantage of Valve's Steam-powered virtual reality platform, though the gaming giant has stressed that the Vive wouldn't be alone for long. HTC Vive versus Oculus Rift – which VR headset reigns supreme?